The following meal advisories for fish found with elevated levels of chlordane, dioxin, methylmercury and polychlorinated biphenyls (PCBs) are based primarily on protecting sensitive populations, most particularly women who are pregnant, nursing, or of childbearing age, fetuses, and children younger than 15 years of age. All advisories may be overprotective for women beyond childbearing age and males 15 years of age and older. PLEASE NOTE: THE METHYLMERCURY ADVISORY APPLIES TO PREDATORY FISH IN ALL ILLINOIS WATERS. Predator fish include all species of black bass (largemouth bass, smallmouth bass, and spotted bass), striped bass, hybrid striped bass, white bass, walleye, sauger, saugeye, flathead catfish, muskellunge, and northern pike. 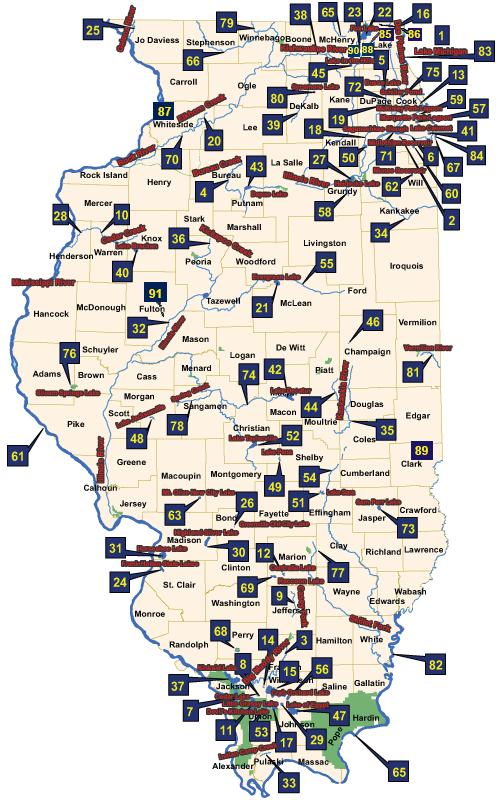 For more information on mercury in Illinois fish, see the "2015 Special Mercury Advisory and "Facts About Illinois' Methylmercury Advisory". For more information about Chlordane and PCBs see "Facts About Illinois' Chlordane Advisory" and "Facts About Illinois' Polychlorinated Biphenyls (PCBs) Advisory".